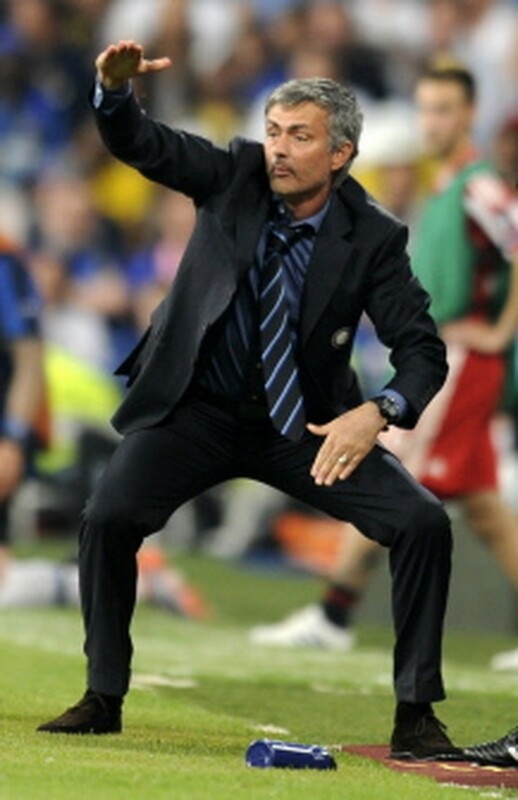 MADRID, May 22, 2010 (AFP) - Jose Mourinho guided Inter Milan to Champions League glory and then confirmed he will hold talks with Real Madrid on Monday. Inter beat Bayern Munich 2-0 at the Santiago Bernabeu in Saturday's big European final, but Mourinho, having won an historic treble with the Italian giants, claimed he now has other coaching challenges ahead. Having become only the third coach to have won Europe's premier competition with two different clubs (he won with Porto in 2004) Mourinho said he now wants to go one better. Mourinho, who joined Inter two years ago, and has also won two Serie A titles and an Italian Cup, is being courted by Real Madrid. He confirmed that he will meet Madrid president Florentino Perez on Monday. "Only Real are interested in me but I haven't spoken with anyone and I haven't signed anything," said the Portuguese coach, who has delivered Inter's first European title since 1965. "When I win I don't stop and in Italy I have won everything. I've won the Champions League with two clubs and I can do it with three. "There are many things (in Italy) that I haven't liked and for three to four months I've been thinking of going." He said that only after speaking to Perez will he know if Real can offer him what he wants. "I don't know their project yet, I need to know it first and that's why I can't (yet) say I'm the coach of Madrid," he said. "I'm the Inter coach, I'm very proud to be Inter coach but if I become Real coach it will be because they are a club with enormous ambition, because they want the same as me, to win and to tackle important and difficult challenges. "It seems that Madrid is a club that wants to win important things but to do so it's not the shirt that wins, it's not money, it's mentality, being ready to play for the club and being together and that's why I'm happy at Inter, it's a fantastic family." And an emotional Mourinho added through tears: "I feel great sadness, in my professional life I try to be as cold as possible. "I've entered into Inter's history, I don't want to speak much because if I do I'll cry and I don't want to do that. "I want a different challenge in my career, now is the time to decide. What's important for Inter is that (president Massimo) Moratti and (captain Javier) Zanetti stay." "If a new life starts for me, it will be here. Inter is an option but Real is a greater option. But I ask for respect for me and for Inter. I need a little time." Mourinho's players, celebrating an historic treble of Serie A, Italian Cup and Champions League titles, are resigned to him leaving. "Unfortunately it's true," said Zanetti. "The coach is leaving. This victory is his. "The next coach will find a great group that's ready to fight on all fronts and we hope we'll be able to win with him as well." Even Moratti admitted that Mourinho's time at the club is up. "Of course it's a sad night as Mourinho is leaving but I'm extremely grateful to him because he's made us win so much and gave us the belief we could win in Europe. "Now there's no need to want too much, we've won the cup and now we'll see who succeeds him. Mourinho is unforgettable." Happel lifted his first European Cup with Feyenoord, 2-1 winners against Celtic in 1970, and claimed a second 13 years later when Hamburg overcame Juventus 1-0. Hitzfeld steered Borussia Dortmund to the 1997 title when they caused an upset in beating Juventus 3-1 before masterminding Bayern's 2001 defeat of Valencia, 5-4 on penalties after a 1-1 draw. Both Happel, with Bruges against Liverpool in 1978, and Hitzfeld, thanks to Bayern's dramatic 1999 reverse against Manchester United in Barcelona, experienced setbacks in European Cup finals before their second triumphs. Bayern coach Louis Van Gaal, whose Ajax team were downed by Juventus in 1996, is the seventh coach to lose two European Cup finals. Marcello Lippi, defeated with Juventus in 1997, 1998 and 2003, is the only coach to finish on the losing side in three finals.